This is a little rough around the edges as I was making it up as I went along. 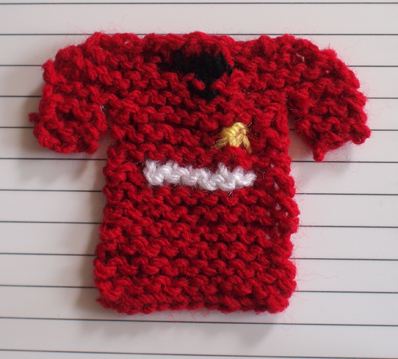 I reckon you could knit a few of these and make some football themed bunting. Colour added using the intarsia method. Cast on 14 stitches in red wool. row 1: knit 4 in red, knit 6 in black, knit 4 in red. row 3: knit 7 in red, knit 2 in black, knit 7 in black. row 5: knit in red. row 6: Put first 4 stitches onto a safety pin. Knit 10 in red. Put last 4 stitches onto a safety pin. Row 7: knit 6 red, knit 2 yellow, knit2 red. row 8: knit 2 red, knit 2 yellow, knit 6 red. row 10: knit 2 red, knit 8 white, knit 2 red. row 11: knit 2 red, knit 8 white, knit 2 red. pick up the stitches from the first pin and knit 3 more rows in red before casting off. Repeat with the second sleeve. Tie off and weave in loose ends.